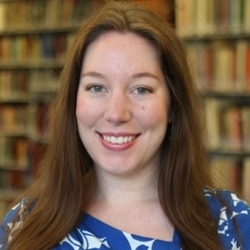 Courtney Baron is Teaching and Learning Librarian, Oxford College Library, Oxford College of Emory University, Oxford, GA. She has been a member of CLS for 2 years. Since college librarians tend to wear many hats, I find the CLS listserv especially valuable because it covers all topics. I was able to attend the Friday Nite Fest at the 2016 ALA Annual conference in Orlando where I connected with a librarian who shared research worksheets she uses to train her student employees on the reference desk. We’ve adapted these worksheets and still continue to use them today. I’m bad with favorites – I can’t choose just one! I read a wide variety of books, especially non-fiction. I’m currently reading Warcross by Marie Lu. If you liked Ready Player One, you’ll love this! While at a conference a few years ago, I attended morning rooftop yoga at the Salt Lake City Library and it continues to be a favorite memory. The library has shops on the first floor and is absolutely beautiful with stunning 360 degree views of the mountains. My current research interests are feminist pedagogy, games in academic libraries, and embedded librarianship in the arts. I subscribe to the ACRL Arts, College Libraries, Framework, and Instruction Section listservs but I’m also an active member of ARLIS/NA. I helped found a staff collection in our library which has the latest releases in the field. I’m working my way through The Fun of Motivation: Crossing the Threshold Concepts by Mary Francis. I also like taking classes. Last year I took an excellent ALA course on Assessing Student Learning with Instructional Technologies, taught by Melissa Mallon. I’m taking a Library Juice Academy course this spring on Feminist Pedagogy for Library Instruction and I’m excited to attend the new ACRL Immersion this summer! What tools or software application amazes you or made a huge difference in your work and why? Zotero is essential for keeping my research organized. I love HaikuDeck for creating easy minimalist presentations. I discovered Canva last year when making an infographic for our library’s annual report and now everyone uses it for all our design and social media needs. Have you learned a new skill recently? If so, tell us more! In the past year, we’ve grown our instruction program to include sound and stage design in Theater classes. We teach students Audacity for creating and editing audio tracks and Sketch- Up for designing 3D spaces.